Traditional "72%" 600g bar of Savon de Marseille made using at least 50% Palm Oil. Authentic "Savon de Marseille", from one of the last three Marseille-based tradional soap manufacturers. 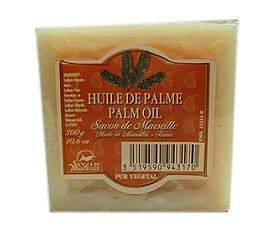 The purity and gentle moisturizing properties of Palm Oil Marseille Soap makes it ideal for sensitive skins and, for this reason, it is recommended by dermatologists all over the world. For centuries, Provence has been connected to the history of soap and is recognized as one of the most prestigious soap producing areas in the world. Dating as far back as the ninth century, master soap makers in Marseille have handmade traditional, gentle soaps using home-produced olive oils. A French law, first introduced in 1688, has allowed only soaps that are manufactured according to prescribed traditional soap-making methods, using pure soap ingredients, can use the famous “Savon de Marseille” The main Savon de Marseille ingredients are olive and vegetable oils, salted water from the Mediterranean Sea and alkaline ash derived from sea plants. Over a period of about two weeks, these ingredients are heated in traditional cauldrons and refined a number of times, before the final solidifying process takes place. Just prior to packaging, following a practice going back generations, authentic Marseille Soap is stamped with its weight in grams. Traditional Marseille Soap colours are green and beige, depending on whether they are based on olive oil (green soap) or palm oil (beige soap). There are currently only three companies still making Marseille soap: le Sérail, la Savonnerie du Midi et la Compagnie du Savon de Marseille.